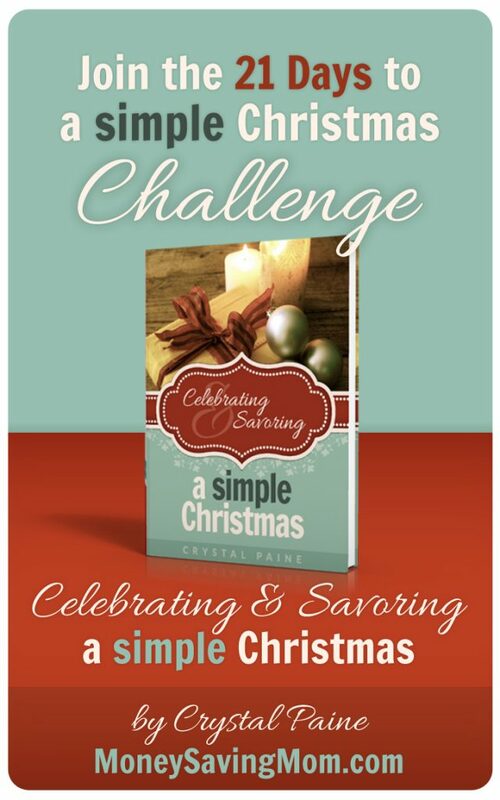 It’s Day 10 of the 21 Days to a Simple Christmas Challenge! I love the Christmas season. I love the sights, smells, tastes, sounds… all of it. But you know what I don’t love? That so many people feel rushed, hurried, and frazzled during Christmas. The heart of Christmas is not about impressing people or running around at a crazy, frantic speed. And making either of those things your focus is certainly not going to help you celebrate and savor the season! One thing that has helped us to slow down and just enjoy December is to create a Christmas Bucket List. We all sit down as a family and choose a few things that each of us really wants to do for Christmas. By the time we’re done discussing our Bucket List, we’ve come up with a great list of memorable activities to do together and since everyone gave their input, there’s something (or more than one thing) on the list that each person will really enjoy. We spread these activities out during the whole month of December, doing a few items each week. Because our list is not long and overwhelming and because we have four weeks to do it, we’re able to really take time to enjoy each thing and create beautiful memories. This tradition has been one of the best things we’ve ever implemented to help us stay focused, calm, and intentional during the Christmas season. And it also helps us to say “no” to most of the other ideas and opportunities that come up that aren’t already on our list. 2. Sit down as a family and create a simple Christmas Bucket List. 3. Look at your calendar and decide when you’re going to do each of these things. If there isn’t time or space, cull a few things off the list. 4. Come back around 8 p.m. tonight where I’ll share our family’s Christmas Bucket List this year and encourage you to do the same. Thanks for that reminder! I needed it today. Love your blog btw!! We decided to simplify this year by staying home for Christmas Eve and Day. One of our children has a birthday on Christmas Eve. We have received a lot of backlash from my husband’s parents about this. They don’t respect our decision and sent us what amounted to a long manifesto about it, in an email. They don’t seem to understand that we’d like to have some of our own traditions, like they had their own traditions when their children were young. We’re standing our ground on this for the sake of our sanity and our kids. We’ve invited the family to our home. I’m willing to do the cooking and all that. However, the in-laws aren’t interested and feel it’s not a holiday unless everyone is at their house (300 mile trip through an area of the country prone to very bad winter weather) and doing everything their way. Thankfully, a good friend of mine is a pastor and she is counseling us through this difficult situation. Her perspective on what Christmas is, based upon a joyful Jesus- has been enlightening to me. I did not know that Christmas is a 12 day long celebration, from 12/25 to Epiphany! I love this idea! What a great way to stay on track during Christmas and remember what’s really important during what can be a frazzled time of year. We just decorated a gingerbread house last night as a family and had a blast spending time together. I’m definitely going to be making a list to come up with some more family activities. Activities are not just for families! As empty nesters we have an absolute blast doing things like this–no whining! The main library here has a fantastic train display. We have gone to see it for three years in a row, and we love taking photos of our boys (ages 3 and 1) and our family in front of the display. It’s probably 10 feet tall and 20 feet in diameter. Very impressive. And it’s free! I also like to choose library books from the displays near the trains–books about trains, winter, and Christmas are featured. Today we made our Christmas Bucket list which includes baking, candy making and going to see Christmas lights and a live nativity. Activities we like to do each year. Way to go! And thanks for the free printable!